The legislators of New Jersey have seen fit to ban cruel gestation crates for pigs, and the pig industry of Iowa demands a Christie vet. Its presidential ambition versus basic compassion and morality, with a deadline of Dec. 1, and I suspect I will not be surprised by which way Christie will go. Being immobilized for all of their existence, lying and living in their own urine and excrement, the sows are sick, sore, atrophied, usually lame, crazed or broken in spirit, and kept alive in these torments only by a massive and reckless use of steroids. The confinement of the sows, presented in terms of solicitude for the piglets, is among the causes of the welfare problem it purports to solve. And the piglets in any case are taken from their mothers in short order to begin their own lives of merciless confinement, mutilation, privation, and fear, in a process, from birth to slaughter, utterly devoid of human compassion. 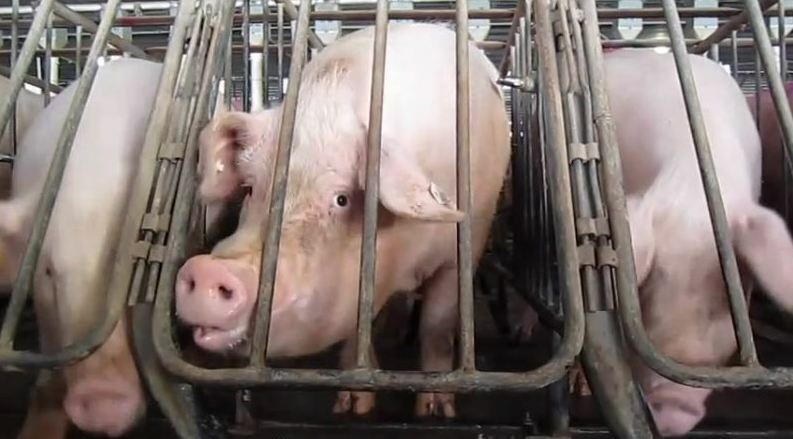 I saw all of this myself once on a visit to a mass-confinement hog farm in North Carolina, the kind of investigative tour that would now be a crime in Iowa, taking in scenes that anyone not numbed to the sight of animal suffering would find abhorrent and deeply disturbing. (Let’s just say that Joni Ernst’s celebrated campaign ad, shot in a sunny, straw-filled showcase instead of a typical industrial hog farm, would have lost its sassy charm had the backdrop been the real thing.) The particular issue of the crates may seem a small matter, these extra few inches for a lowly pig, so miserable already and doomed to a nightmarish end. But that’s not a thought I’d stress if I were one of those guys from the National Pork Producers Council talking to Governor Christie. It only draws attention to the sheer pettiness, the unfeeling, unyielding, unchristian spirit, of anyone who would refuse so minimal a comfort to an afflicted animal. If you and I made a living doing things like this to weak and defenseless creatures, we’d want to steer clear of legal scrutiny too, protesting against intrusions into our private commercial pursuits. But the argument that the bill on Governor Christie’s desk would constitute an undue regulatory burden on hog farmers, by directing the state board of agriculture to write new rules forbidding gestation crates, falls apart the moment you pause to think about it. Yes, yes it does. And the unspeakable cruelty of industrial pig farming is not an issue that should be ignored for any political purpose.